While Diamond Dynasty remains the crown jewel in MLB The Show 17 for SDS — receiving the most attention from the developers, thanks in no small part to being a cash cow that sees players spending small fortunes to stack their teams with powerful squads — it’s a mode that still remains intimidating and inaccessible for many. This is likely because many players simply refuse to invest the same kind of capital as others and therefore believe it’s not even worth trying to keep up with all of the Joneses with deep pockets. But the reality is you don’t actually need to spend so much as a dime in order to put together a competitive Diamond Dynasty squad. You just need to know how to harness all of the resources the game provides you free of charge to cobble together a team that can take you up the leaderboard. 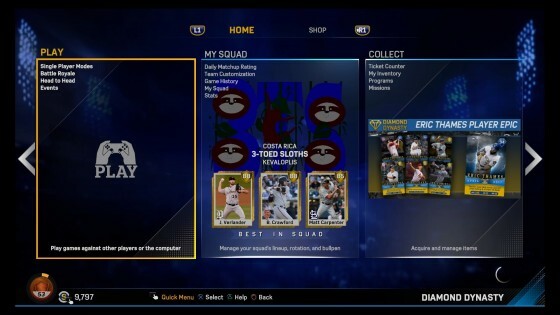 Here are some tips that can have you climbing the Diamond Dynasty ranks in no time. If you have been playing the game in any capacity, you have been receiving rewards for every day you login to the game and after every game that you play, regardless of whether this is offline or online. Of course, if you don’t play Diamond Dynasty, there’s a good chance the player cards you receive as rewards have largely been meaningless to you. If that’s the case, now’s the time to log into Diamond Dynasty and take stock of your squad for the first time. Chances are, if you play at least semi-regularly, you will have managed to procure at least a few silver, gold or perhaps even diamond cards that can quickly become the cornerstones of your team. This is how I managed to snag many of my own starters, including Brandon Crawford, Matt Carpenter and George Springer. What you didn’t realize was the answer to how you start building a great squad is already right there in front of you. As you’ve been playing the game, you’ve also been accumulating Stubs (and Tickets) whether you know it or not. This is the in-game currency you can take to the marketplace (accessible either through the game or online at theshownation.com) to purchase new players for your squad. With the recent introduction of new card packs, some of the better players have become more and more common, so it’s never been easier to find guys who can help out your team for an affordable amount of Stubs. When you find a player on the marketplace you’d like to add to your squad, place a Buy Now order for him at a price slightly above the price listed in the Sell Now field. Of course, if you want to avoid getting into any sort of bidding war, you could always just click Buy Now instead, but this is always going to cost you more of your precious stubs. 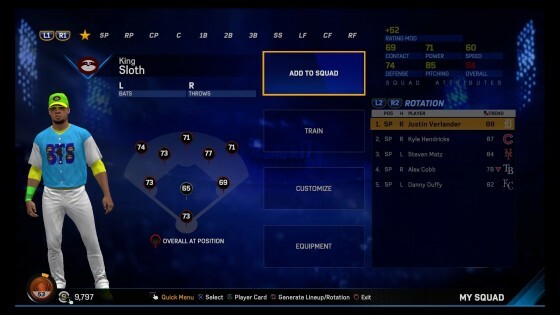 So it’s possible to field practically a whole squad that could ascend the Diamond Dynasty tiers pretty quickly for less than 3,000 Stubs. Then, as you play more games and earn more Stubs and rewards, you can start to replace some of these more affordable options with better and more expensive options one position at a time. Oh, and don’t forget to create sell orders for all those players you don’t need any more so you can re-invest the Stubs elsewhere. 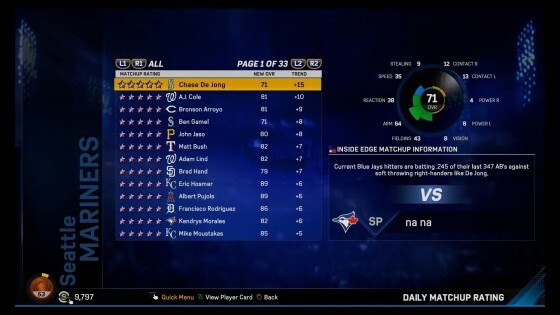 While we’re on the subject of how to spend your hard-earned Stubs, it’s also crucial to remember that players’ ratings are always changing based on how they perform in real life, thanks to The Show’s Inside Edge modifications. Like playing any market, it’s advantageous to buy low on players who you think might be due for a bump in ratings based on how things are going for them on the field. For example, Aaron Judge has been absolutely mashing the ball since the season started (so much so in fact that SDS created their own April card for him), but he’s currently sitting at an 82 overall and can be purchased for around 700 stubs. If he continues hitting at this torrid pace, he’ll undoubtedly be due for another bump in ratings at some point, perhaps even becoming a diamond before season’s end. So if you were to purchase him now and wait it out, your investment could pay dividends somewhere down the line. In addition to all of the real-life players you’ll want to have in your lineup, Diamond Dynasty also allows one player you can create yourself to further bolster your squad. Just like with Road to the Show, you can customize his name and appearance whichever way you like and then build up his skills over time. Unlike RttS, however, the way to improve those skills is to feed him cards and watch him slowly develop into a monster. The best way to do this is to use all those common or bronze cards of lesser players you accumulate that won’t fetch you many Stubs on the market anyway and patiently keep pumping them into your creation like some kind of Frankenstein’s monster until he’s proficient enough at a position that he’ll actually improve your team (or at least won’t diminish it). Before you know it, you’ll have a player who’s a 99 overall superstar on your squad, and not only did you not have to spend anything to get him, there’s no other player quite like him out there in the marketplace. You’ll probably find that playing with silver and gold players can take you pretty far up the Diamond Dynasty ladder, but you’re bound to hit a wall eventually that can only be breached by obtaining some diamonds. There are a few ways you can try to get your hands on these diamonds without breaking the bank. 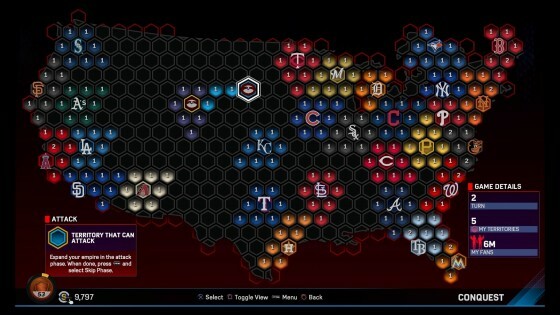 While I’ve always found Conquest mode to be a bit of a tedious slog where you’re forced to grind away inning after inning against the computer, the fact is that many people find it rewarding and, more importantly, it’s the cheapest way to obtain diamond players who can immediately help take your team to the next level. By conquering strongholds and completing the subsequent missions, you’ll eventually be able to unlock a handful of coveted diamond cards. If you’re not up for sticking strictly to conquest, there are also plenty of other achievements to be rewarded for under the Diamond Dynasty missions and programs menus, all of which involve completing different tasks across a variety of modes. These are highly specific and many are rather time-consuming, but grinding your way through them is still way better than saving up the thousands of Stubs it would otherwise cost to be able to get those valuable diamonds onto your squad. As you can see, there’s plenty of different ways you can build an elite Diamond Dynasty squad without having to spend your hard-earned cash. Some of these, like missions and Conquest mode, might try your patience, but don’t feel obligated to grind those innings unless it’s something you really want to do. The game is supposed to be fun, and Diamond Dynasty can be just that without feeling overwhelming or frustrating as you compete against (and hopefully defeat) the people who have shelled out hundreds or perhaps even thousands of dollars for their squad.